Stand face-to-face with the grandeur of the Panama Canal. Enjoy the sounds of a mariachi band in Mexico. Explore the coral reefs in the Western Caribbean. Celebrity Cruises is the only cruise line that gives you a full vacation while crossing the Continental Divide. When your Celebrity ship enters the canal, it will rise 85 feet in one of the legendary Gatun Locks. As you cross the Continental Divide - a journey that took mariners of long ago many years to complete - a new world of wonder and amazement awaits you on the other side. Join us for what will undoubtedly be an enlightening and rewarding journey. GO BETTER with Celebrity Cruises! Where does the inspiration come from? On a Celebrity cruise it comes from the many possibilities you'll encounter onboard, each designed to open your eyes, capture your imagination, and broaden your horizons. It comes from your surroundings - from the spectacular glaciers in every direction and the thoughtful design of our ships. And it comes from the unexpected pleasures, like the breaching of a humpback whale off the port bow to the feeling that you've just arrived the moment you climb onboard our world-class ships. Inspiration comes from the perfectly crafted entree that is proudly and elegantly served in one of our many onboard restaurants where the decor rises to the level of the award-winning menu. Inspiration envelopes you in our Lavish Canyon Ranch SpaClub where everything but the moment disappears. It's where an ordinary cruise becomes an exceptional vacation experience. And most of all, it's where having nothing to worry about means everything. On a Celebrity cruise, inspired designed is everywhere and in every detail. Welcome to Celebrity's Panama Canal cruise experience. 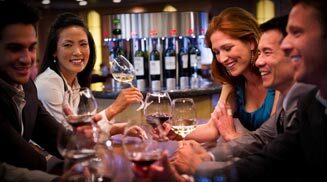 Celebrity Cruises shows travelers the world like no one else can, and they'll treat you famously along the way. Welcome aboard champagne, white-glove service, and a spa like no other. These are just a few reasons why Celebrity is the best value cruising Mexico. You'll feel relaxed after this vacation! Celebrity's Star Treatment is about making you the center of our attention - from the moment you book your cruise through the exceptional memories you carry home - while offering more of what you come on vacation to enjoy. It's a fleet of exquisite ships, embracing design that is both classical and cutting edge, inspiring you in every way. Where the public spaces create a sense of wonder, and private spaces offer a serene sanctuary. It's a dining experience of both impeccable quality and infinite choice, with flavours to suit your every mood. It's about transporting you into a world of relaxation in our state-of-the-art Canyon Ranch SpaClub, while guiding you to some of the world's most spectacular destinations. But above all, it's service with style that Celebrates you. 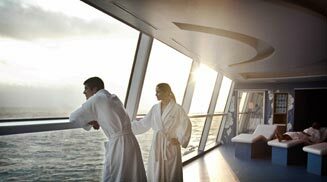 Discover the state of complete tranquility in one of the largest, most luxurious spas afloat. The AquaSpa offers an array of treatments designed to take you to a higher level of relaxation. Working closely with Elemis, one of the leading providers of health and beauty solutions, we've developed a wealth of transformative treatments that draw on cultures from around the world. Celebrity Cruises Youth & Teen Program allows families to travel together in five-star luxury in Mexico. Our award-winning cruise experience is designed for kids, too. There's so much for children and teens to do onboard a Celebrity Cruise. All programs are geared to specific age groups and supervised by experienced youth staff members. Celebrity kids are happy, engaged, and entertained. You'll get all the details once you've boarded, but here's a peek at what's available. Michael's Club - Share cognac in the warm ambience of this club, accompanied by the sophisticated sounds of a grand piano. The deep, welcoming chairs of Michael's Club make it the ideal place to savor a single-malt scotch or late-evening cordial. Martini Bar - The classic; vigorously shaken - not stirred - with three plump green olives. Or, perhaps a trendier "Chocolate Kiss" is more your style. Offering 26 varieties of this quintessential beverage, one is sure to be your new favorite. With over 100 varieties of vodka to choose from and a chic ice-frosted counter top, it's the coolest place on the ship. Crush - This intimate alcove, located adjacent to the Martini Bar, offers spectacular vodka and caviar pairings on an ice-filled table. Champagne Bar - Plush seating and subdued lighting make an intimate conversation and a romantic champagne toast. Well, perfect.